Flying with car seats–in the cabin? The TravelMate gives your car seat a gliding set of wheels and height adjustable handle for smooth steering through the airport. Infant carrier car seats that “ride” on strollers as a “travel system” or on simple stroller frames are fantastic for travel. While your child still fits in his infant car seat (see recommended infant car seats for travel here), your best option may be to simply bring your infant-in-car-seat and stroller or stroller frame all to the gate. If you will be using the car seat on an airplane, just check the stroller or stroller frame at the gate. Just ask for the necessary tag at the counter there. If you are unexpectedly offered a free seat for your infant flying as a lap child (doesn’t happen as often as it used to, but it’s not entirely unheard of), you’ll have the car seat with you to use during your flight. If you have a stroller with two separate handles, you may be able to put the carrying handle of your infant car seat in the farthest back position and “hang” it over your stroller handle. If traveling with a convertible or toddler car seat, you may be able to lengthen the straps of your car seat and loop them over the handles with the car seat facing your stroller. Just remember, if your travel stroller is very lightweight, you’ll want to remove the car seat before removing your child to avoid a tip over (the same goes for when you hang that heavy diaper bag or daypack on it). 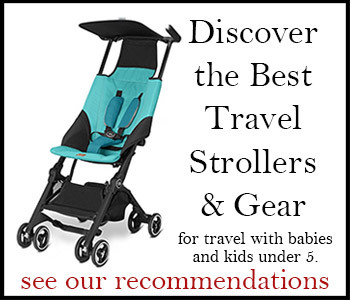 See recommended strollers in the Best Lightweight Strollers for Travel. You can try wearing the car seat over your shoulders by lengthening the straps, which keeps your hands free for rolling the suitcase or pushing your stroller. Though if your car seat isn’t a good fit for you, you may change your mind about this plan somewhere around Gate 47. A better solution is a purpose-built car seat backpack carrier like the Brica Cover Guard. or any of the various car seat carrying cases that include backpack or shoulder carrying straps (especially if you’ll be traveling alone with your child or with more than one child). Flying with car seats–checked at the gate? This car seat travel bag by Brica can be carried or rolled as needed. JL Childress and Brica both offer protective car seat travel bags that fit a wide variety of toddler car seats and come with backpack carrying straps or inline skate wheels (Brica’s model offers both). See more about their current models and advantages of each here. Still wondering what to do with your child? Several models of toddler car seats can be attached to the GoGo Kidz TravelMate Cart or Brica Roll ’n Go transporter, which makes it possible to wheel your child right to the gate in his own car seat, and possibly right down the aisle of larger aircraft (no promises here, however). You can read more about the GoGo Kidz TravelMate in Car Seat Travel Bags and Carriers. A more economical solution, the Traveling Toddler car seat strap attaches your child’s car seat to your rolling carry-on. It enables you to roll your child strapped in her car seat through the airport along with one carry-on suitcase. You can read more about the Traveling Toddler in Car Seat Travel Bags and Carriers. If you’ll travel much by airplane and/or taxi with your baby or young toddler, you might also consider the Sit ’n’ Stroll convertible car seat that converts to a stroller (can be used from 5 lbs to 40 lbs, rear- and forward-facing; available occasionally through limited sellers… I advise looking for one gently used or renting if you have difficulty finding one new). Want more help preparing to fly with a baby or toddler? You’ll find more than 80 pages of helpful advice on planning, preparing for, and perfecting air travel with children under 5 in the award-winning Travels with Baby: The Ultimate Guide for Planning Travel with Your Baby, Toddler, and Preschooler. And be sure to stop by the Flying with Babies, Toddlers, and Preschoolers Tips page at TravelswithBaby.com. Ask Shelly: How to find a trustworthy hotel babysitter on Oahu?